Dilemma, dilemma. I just returned from a great camping trip in Oregon and I’m dying to share a few quick and easy camp food posts with you! But then I looked at my calendar and realized that the Labor Day weekend is just a few days away! What to do, what to do… post some killer campsite dishes or give you a great grilling dish to say farewell to summer. After some internal toiling, I decided to go with a fantastic burger to give you plenty of prep time for any Labor Day festivities that you may have planned. If you were hoping for a few camping dishes, not to worry – those are coming on Friday. Labor Day – it’s a holiday to thank the American worker for all of their contributions made to strengthen and solidify the overall well-being of the country. It has also come to symbolize the end of summer and hence the end of grilling season. If you’re into grilling, chances are you’ve already grilled a few burgers this season. In that case, I know you already know how to make a classic burger. 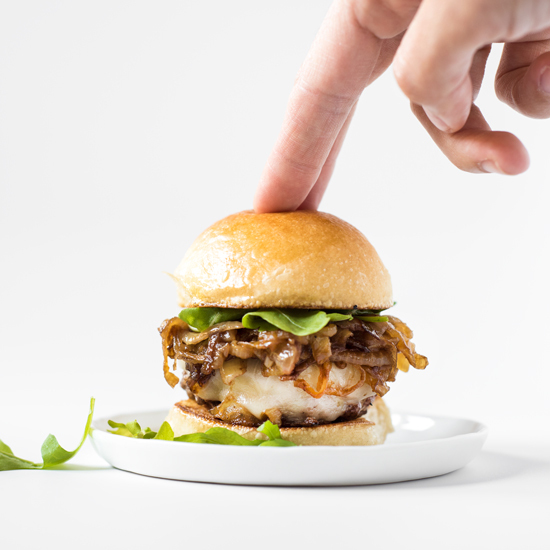 However, if you happen to be a burger novice, no need to worry, this is a recipe packed with flavor and easy to follow, for pros and novices alike. Take the classic burger you know and love and give it a Mediterranean twist; what do you have? A succulent and juicy Greek Burger with Tzatziki, Tapenade, and Feta. If you haven’t had a lamb burger before, now is the time to try! Lamb pairs perfectly with the Mediterranean flavors of tzatziki, tapenade, and feta. You’re not into lamb, you say? No need to worry, this burger is great with beef or turkey too! I’ll talk to you again on Friday and have some camp-friendly food suggestions! Until then, enjoy the rest of your week! 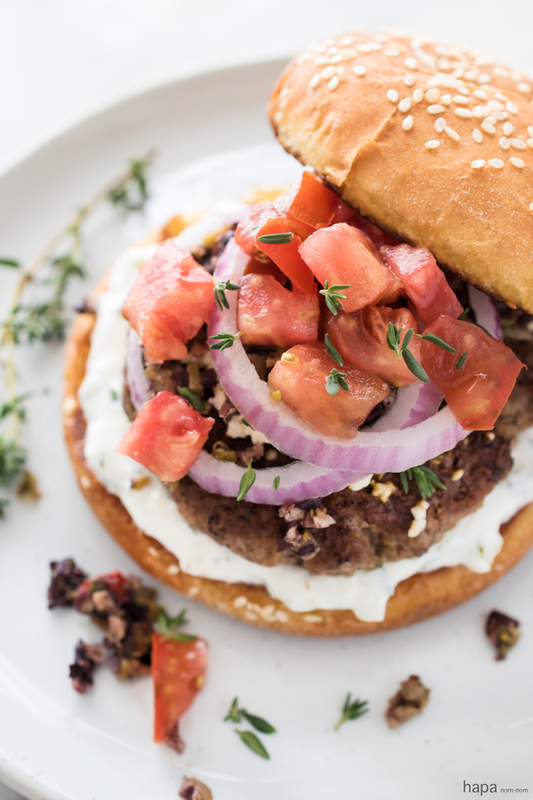 Juicy and succulent Greek Burger with Tzatziki, Tapenade, and Feta - perfect for the grill or in the skillet and packed with the great Mediterranean flavors you love! To make the tzatziki, use a mortar and pestle to mash the garlic and salt together until it forms a paste. If you do not have a mortar and pestle start by finely mincing the garlic. Sprinkle the garlic with salt and then tilt the blade so that it forms a shallow angle with the cutting board. Scrape the knife across the garlic repeatedly, until it forms a paste. Then in a medium bowl, combine the yogurt, tahini, mint, and lemon. Add the garlic and salt mixture and combine well. Fold the cucumber into yogurt mixture and refrigerate until ready to use. (This can be made the night before). Add all of the ingredients for the tapenade to the bowl of a food processor. Process until nearly smooth. (This can be made the night before and refrigerated). Drain the diced tomatoes in a colander placed in the sink. Heat your grill to high. * If you're not grilling, heat a heavy bottomed grill pan over high heat. Divide the ground meat into 4 equal portions. Form them into loose patties a little larger than the diameter of the buns (the patties will shrink when cooked). Once formed make a shallow indentation in the center of each burger. Brush each side of the patty with the oil and sprinkle each side with salt and pepper. Cook the burgers for 3 minutes on the first side and 4 minutes the second side. ** During the last minute of cooking, top each burger with a heaping tablespoon of feta and cover. Remove from the grill and allow to rest for a couple of minutes. In the meantime, toast the buns on grill for about a minute. Spread the tzatziki on the bun bottoms and top each a burger patty. Top with tapenade, tomatoes, red onions, and thyme. Cover with the bun tops, serve immediately and enjoy! * Lamb can be a bit a fatty, so when the fat drips over the flames of the hot coals it can create flare ups - not good for your burger. To avoid this from happening, close the lid and vents of your grill to starve it of oxygen. ** For medium-rare, cook beef and lamb for a total of 7 minutes. If you're using turkey, you must make sure that they are cooked all the way through to prevent salmonella - the internal temp must reach 165 degrees F.
i especially dig the simple tapenade you chose to use with this burger build, kathleen. i am thinking i could eat that with a spoon. then going for a bit of tahini in your tzatziki… my test kitchen mind is freaking… sounds brilliant clever delicious. I love mediterranean and middle eastern food as well and I eat tzatziki like it’s going out of style. All of the fresh ingredients and aromatics make me crave it all the time and I’m a total sucker for any Persian stew. I hope you have a wonderful Labor Day weekend, Beeta! Whoa! I love lamb and can’t think of a single good reason why I’ve never had a lamb Greek burger with tzatziki? This is going on the must do list! I love lamb too… obviously 😉 I hope you enjoy and have a great Labor Day weekend, Rachelle! We don’t love lamb in my household, but I would love a couple of these with beef or turkey over the Labor Day weekend. This burger sounds so flavorful with the tzatziki and the tapenade. Have a great Labor Day weekend, Kathleen! Ha! No problem, Gigi 😉 Welcome to my world, I’m always craving Greek! I’m glad you posted this because this is a delicious looking burger, but I can’t wait to see your camp food recipes. Thank you my dear 🙂 I think I could put tzatziki on anything! Well, anything Greek and you know that I’m sold, Kathleen, but I especially love the little touches you’ve added to this burger – like the tapenade and the sundried tomatoes … mmm!